New remix album from Miami-based producer Mydus (previously featured here. 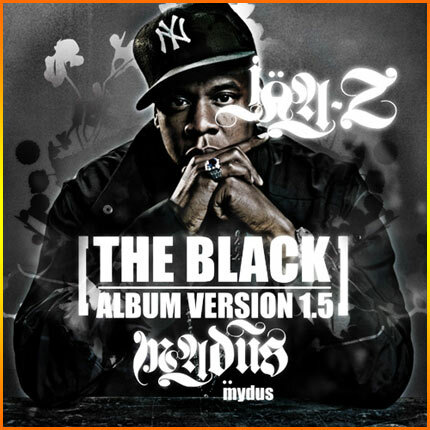 The Black Album Version 1.5, Mydus' take on Jay-Z's final penultimate album, features all thirteen of the album's tracks remixed with original beats. At this point, Jigga's Black Album has been remixed into almost every shade of the rainbow - from Danger Mouse's Grey Album to Kev Brown's Brown Album to Cheap Cologne's Double Black Album - so I wouldn't blame anyone for wondering what was left for Mydus to contribute. As it turns out, though, the beats on here are good enough to stand apart from the rest of the Black Album remixes. While most of the other remix albums were built around a specific concept, Mydus' only goal, in his own words, was to take "a shot at what I can do with an album that I thought had so much more potential." Mission accomplished.